We’re conducting the first full group test of this year’s leading superbikes over the next few days. But we’re confident the next few days will give us a chance to ride the Kawasaki ZX-10R, Honda FireBlade and Suzuki GSX-R1000 to their limits for performance testing at Bruntingthorpe Proving Ground. They will also go on the dyno to reveal the truth behind the power claims. And they’ll go head to head on real roads. Also coming soon: We’re heading for the south of France with the new Suzuki GSX-R600, Kawasaki ZX-6R, Yamaha R6, Honda CBR600RR, Triumph Daytona 600 and Ducati 749S for the world’s first group test of the big six supersports contenders. Expect our initial test verdicts early in the week starting February 2. See all these bikes at the MCN London Motorcycle Show. 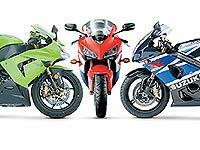 Thinking of buying or selling a bike? Check out our new section.